Not to be confused with cruiser. A cruise ship is a passenger ship used for pleasure voyages when the voyage itself, the ship's amenities, and sometimes the different destinations along the way (i.e., ports of call), form part of the passengers' experience. Transportation is not the only purpose of cruising, particularly on cruises that return passengers to their originating port (known as "closed-loop cruises"). On "cruises to nowhere" or "nowhere voyages", cruise ships make 2-to-3 night round trips without any ports of call. In contrast, dedicated transport-oriented ocean liners do "line voyages" and typically transport passengers from one point to another, rather than on round trips. Traditionally, shipping lines build liners for the transoceanic trade to a higher standard than that of a typical cruise ship, including higher freeboard and stronger plating to withstand rough seas and adverse conditions encountered in the open ocean, such as the North Atlantic. Ocean liners also usually have larger capacities for fuel, food, and other stores for consumption on long voyages, compared to dedicated cruise-ships, but few ocean liners remain in existence—note the preserved liners and Queen Mary 2, which make scheduled North Atlantic voyages. Although often luxurious, ocean liners had characteristics that made them unsuitable for cruising, such as high fuel-consumption, deep draughts that prevented their entering shallow ports, enclosed weatherproof decks inappropriate for tropical weather, and cabins designed to maximize passenger numbers rather than comfort (such as a high proportion of windowless suites). The gradual evolution of passenger-ship design from ocean liners to cruise ships has seen passenger cabins shifted from inside the hull to the superstructure and provided with private verandas. Modern cruise ships, while sacrificing some qualities of seaworthiness, have added amenities to cater to water tourists, and recent vessels have been described as "balcony-laden floating condominiums". Cruising has become a major part of the tourism industry, accounting for U.S.$29.4 billion, with over 19 million passengers carried worldwide as of 2011[update]. The industry's rapid growth has seen nine or more newly built ships catering to a North American clientele added every year since 2001, as well as others servicing European clientele. Smaller markets, such as the Asia-Pacific region, are generally serviced by older ships. These are displaced by new ships in the high-growth areas. 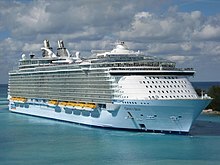 As of 2019[update] the world's largest cruise-ship was Royal Caribbean International's Symphony of the Seas along with its three sister ships Harmony of the Seas, Allure of the Seas, and Oasis of the Seas which round out the top 4 largest cruise liners in the world. The birth of leisure cruising began with the formation of the Peninsular & Oriental Steam Navigation Company in 1822. The company started out as a shipping line with routes between England and the Iberian Peninsula, adopting the name Peninsular Steam Navigation Company. It won its first contract to deliver mail in 1837. In 1840, it began mail delivery to Alexandria, Egypt, via Gibraltar and Malta. The company was incorporated by Royal Charter the same year, becoming the Peninsular and Oriental Steam Navigation Company. RMS Strathaird, a P&O cruise ship of the early 20th century. The company began offering luxury cruise services in 1844. P&O first introduced passenger cruising services in 1844, advertising sea tours to destinations such as Gibraltar, Malta and Athens, sailing from Southampton. The forerunner of modern cruise holidays, these voyages were the first of their kind, and P&O Cruises has been recognised as the world's oldest cruise line. The company later introduced round trips to destinations such as Alexandria and Constantinople. It underwent a period of rapid expansion in the latter half of the 19th century, commissioning larger and more luxurious ships to serve the steadily expanding market. Notable ships of the era include the SS Ravenna built in 1880, which became the first ship to be built with a total steel superstructure, and the SS Valetta built in 1889, which was the first ship to use electric lights. Some sources[which?] mention Francesco I, flying the flag of the Kingdom of the Two Sicilies (Italy), as the first cruise ship. She was built in 1831 and sailed from Naples in early June 1833, preceded by an advertising campaign. The cruise ship was boarded by nobles, authorities, and royal princes from all over Europe. In just over three months, the ship sailed to Taormina, Catania, Syracuse, Malta, Corfu, Patras, Delphi, Zante, Athens, Smyrna, Constantinople, delighting passengers with excursions and guided tours, dancing, card tables on the deck and parties on board. However, it was restricted to the aristocracy of Europe and was not a commercial endeavour. 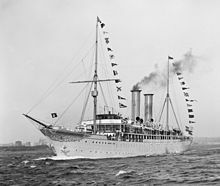 The cruise of the German ship Augusta Victoria in the Mediterranean and the Near East from 22 January to 22 March 1891, with 241 passengers including Albert Ballin and wife, popularized the cruise to a wider market. Christian Wilhelm Allers published an illustrated account of it as Backschisch (Baksheesh). The first vessel built exclusively for luxury cruising, was Prinzessin Victoria Luise of Germany, designed by Albert Ballin, general manager of Hamburg-America Line. The ship was completed in 1900. The practice of luxury cruising made steady inroads on the more established market for transatlantic crossings. In the competition for passengers, ocean liners added luxuries — Titanic being the most famous example — such as fine dining, luxury services, and staterooms with finer appointments. In the late 19th century, Albert Ballin, director of the Hamburg-America Line, was the first to send his transatlantic ships out on long southern cruises during the worst of the winter season of the North Atlantic. Other companies followed suit. Some of them built specialized ships designed for easy transformation between summer crossings and winter cruising. In 1897, there were three luxury liners for transportation, for the Europe to North America trip. These were European-owned. In 1906, the number had increased to seven. The British Inman Line owned City of Paris, the Cunard Line had Compania and Lucania. The White Star Line owned Majestic and Teutonic. La Lorraine and La Savoie were owned by the French Compagnie Générale Transatlantique. With the advent of large passenger jet aircraft in the 1960s, intercontinental travelers switched from ships to planes sending the ocean liner trade into a terminal decline. Certain characteristics of older ocean liners made them unsuitable for cruising duties, such as high fuel consumption, deep draught preventing them from entering shallow ports, and cabins (often windowless) designed to maximize passenger numbers rather than comfort. Ocean liner services aimed at passengers ceased in 1986, with the notable exception of transatlantic crossings operated by the British shipping company Cunard Line, catering to a niche market of those who appreciated the several days at sea. In an attempt to shift the focus of the market from passenger travel to cruising with entertainment value, Cunard Line pioneered the luxury cruise transatlantic service on board the Queen Elizabeth 2 ocean liner. International celebrities were hired to perform cabaret acts onboard and the crossing was advertised as a vacation in itself. Queen Elizabeth 2 also inaugurated "one-class cruising" where all passengers received the same quality berthing and facilities. This revitalized the market as the appeal of luxury cruising began to catch on, on both sides of the Atlantic. The 1970s television series Love Boat, helped to popularize the concept as a romantic opportunity for couples. Another ship to make this transition was SS Norway, originally the ocean liner SS France and later converted to cruising duties as the Caribbean's first "super-ship". Contemporary cruise ships built in the late 1980s and later, such as Sovereign-class which broke the size record held for decades by Norway, showed characteristics of size and strength once reserved for ocean liners — some have undertaken regular scheduled transatlantic crossings. The Sovereign-class ships were the first "megaships" to be built for the mass cruising market, they also were the first series of cruise ships to include a multi-story atrium with glass elevators. They also had a single deck devoted entirely to cabins with private balconies instead of oceanview cabins. Other cruise lines soon launched ships with similar attributes, such as the Fantasy-class, leading up to the Panamax-type Vista-class, designed such that two thirds of the oceanview staterooms have verandas. As the veranda suites were particularly lucrative for cruise lines, something which was lacking in older ocean liners, recent cruise ships have been designed to maximize such amenities and have been described as "balcony-laden floating condominiums". Until 1975-1980, cruises offered shuffleboard, deck chairs, "drinks with umbrellas and little else for a few hundred passengers". After 1980, they offered increasing amenities. As of 2010, city-sized ships have dozens of amenities. There have been nine or more new cruise ships added every year since 2001, including the 11 members of the Vista-class, and all at 100,000 GT or greater. The only comparable ocean liner to be completed in recent years has been Cunard Line's Queen Mary 2 in 2004. Following the retirement of her running mate Queen Elizabeth 2 in November 2008, Queen Mary 2 is the only liner operating on transatlantic routes, though she also sees significant service on cruise routes. Queen Mary 2 was for a time the largest passenger ship before being surpassed by Royal Caribbean International's Freedom-class vessels in 2006. The Freedom-class ships were in turn overtaken by RCI's Oasis-class vessels which entered service in 2009 and 2010. A distinctive feature of Oasis-class ships is the split "open-atrium" structure, made possible by the hull's extraordinary width, with the 6-deck high "Central Park" and "Boardwalk" outdoor areas running down the middle of the ship and verandas on all decks. In two short decades (1988-2009), the largest class cruise ships have grown a third longer (268 m to 360 m), almost doubled their widths (32.2 m to 60.5 m), doubled the total passengers (2,744 to 5,400), and tripled in weight (73,000 GT to 225,000 GT). Also, the "megaships" went from a single deck with verandas to all decks with verandas. Whereas the golden age of ocean liners has faded, the golden age of cruise ships may well be these recent decades and decades to come. Operators of cruise ships are known as cruise lines, which are companies that also market cruises to the public. Cruise lines have a dual character; they are partly in the transportation business, and partly in the leisure entertainment business, a duality that carries down into the ships themselves, which have both a crew headed by the ship's captain, and a hospitality staff headed by the equivalent of a hotel manager. Among cruise lines, some are direct descendants of the traditional passenger shipping lines (such as Cunard), while others were founded from the 1960s specifically for cruising. Historically, the cruise ship business has been volatile. The ships are large capital investments with high operating costs. A persistent decrease in bookings can put a company in financial jeopardy. Cruise lines have sold, renovated, or renamed their ships to keep up with travel trends. Cruise lines operate their ships virtually 24 hours a day, seven days a week, 52 weeks a year. A ship which is out of service for routine maintenance means the loss of tens of millions of dollars. If the maintenance is unscheduled, it can result, potentially, in thousands of dissatisfied customers. A wave of failures and consolidations in the 1990s led to many cruise lines being bought by much larger holding companies and continue to operate as "brands" or subsidiaries of the holding company. Brands continue to be maintained partly because of the expectation of repeat customer loyalty, and also to offer different levels of quality and service. For instance, Carnival Corporation & plc owns both Carnival Cruise Line, whose former image were vessels that had a reputation as "party ships" for younger travelers, but have become large, modern, yet still profitable, and Holland America Line, whose ships cultivate an image of classic elegance. In 2004, Carnival had merged Cunard's headquarters with that of Princess Cruises in Santa Clarita, California so that administrative, financial and technology services could be combined, ending Cunard's history where it had operated as a standalone company (subsidiary) regardless of parent ownership. However, Cunard did regain some independence in 2009 when its headquarters were moved to Carnival House in Southampton. The common practice in the cruise industry in listing cruise ship transfers and orders is to list the smaller operating company, not the larger holding corporation, as the recipient cruise line of the sale, transfer, or new order. In other words, Carnival Cruise Line and Holland America Line. for example, are the cruise lines from this common industry practice point of view; whereas Carnival Corporation & plc and Royal Caribbean Cruises Ltd., for example, can be considered holding corporations of cruise lines. This industry practice of using the smaller operating company, not the larger holding corporation, is also followed in the list of cruise lines and in member-based reviews of cruise lines. Some cruise lines have specialties; for example, Saga Cruises only allows passengers over 50 years old aboard their ships, and Star Clippers and formerly Windjammer Barefoot Cruises and Windstar Cruises only operate tall ships. Regent Seven Seas Cruises operates medium-sized vessels—smaller than the "megaships" of Carnival and Royal Caribbean—designed such that 90% of their suites are balconies. Several specialty lines offer "expedition cruising" or only operate small ships, visiting certain destinations such as the Arctic and Antarctica, or the Galápagos Islands. John W. Brown, which formerly operated as part of the United States Merchant Marine during World War II before being converted to a museum ship, still gets underway several times a year for six-hour "Living History Cruises" that take the ship through Baltimore Harbor, down the Patapsco River, and into the Chesapeake Bay, and she is also the largest cruise ship operating under the American flag on the United States East Coast. Currently the five largest cruise line holding companies and operators in the world are Carnival Corporation & plc, Royal Caribbean Cruises Ltd., Star Cruises (which owns 50% of Norwegian Cruise Line; NCL in its own right is the third largest line), MSC Cruises, and Louis Cruise Lines. Louis Cruises has largely grown its fleet through purchasing older second- or third-hand ships, while the other four operators have largely constructed their own vessels and combined own the majority of the "megaships". As an industry, the total number of cabins on all of the world's cruise ships amount to less than 2% of the world's hotel rooms. Dining on almost all cruise ships is included in the cruise price. Traditionally, the ships' restaurants organize two dinner services per day, early dining and late dining, and passengers are allocated a set dining time for the entire cruise; a recent trend is to allow diners to dine whenever they want. Having two dinner times allows the ship to have enough time and space to accommodate all of their guests. Having two different dinner services can cause some conflicts with some of the ship's events (such as shows and performances) for the late diners, but this problem is usually fixed by having a shorter version of the event take place before late dinner. Cunard Line ships maintain the class tradition of ocean liners and have separate dining rooms for different types of suites, while Celebrity Cruises and Princess Cruises have a standard dining room and "upgrade" specialty restaurants that require pre-booking and cover charges. Many cruises schedule one or more "formal dining" nights. Guests dress "formally", however that is defined for the ship, often suits and ties or even tuxedos for men, and formal dresses for women. The menu is more upscale than usual. Besides the dining room, modern cruise ships often contain one or more casual buffet-style eateries, which may be open 24 hours and with menus that vary throughout the day to provide meals ranging from breakfast to late-night snacks. In recent years, cruise lines have started to include a diverse range of ethnically themed restaurants aboard each ship. Ships also feature numerous bars and nightclubs for passenger entertainment; the majority of cruise lines do not include alcoholic beverages in their fares and passengers are expected to pay for drinks as they consume them. Most cruise lines also prohibit passengers from bringing aboard and consuming their own beverages, including alcohol, while aboard. Alcohol purchased duty-free is sealed and returned to passengers when they debark. There is often a central galley responsible for serving all major restaurants aboard the ship, though specialty restaurants may have their own separate galleys. As with any vessel, adequate provisioning is crucial, especially on a cruise ship serving several thousand meals at each seating. For example, a quasi "military operation" is required to load and unload 3600 passengers and eight tons of food at the beginning and end of each cruise, for the Royal Princess. Cruise ships require electrical power, normally provided by diesel generators. When docked ships must run their generators continuously to power on-board facilities, unless they are capable of using onshore power, where available. Polluting emissions from the diesel engines can be equivalent to 700 lorries running their engines, and is harmful where ships dock in populated areas. Some cruise ships already support the use of shorepower, while others are being adapted to do so. Some ships have bowling alleys, ice skating rinks, rock climbing walls, sky-diving simulators, miniature golf courses, video arcades, ziplines, surfing simulators, basketball courts, tennis courts, chain restaurants and/or ropes obstacle courses. Crew is usually hired on three to eleven month contracts which may then be renewed as mutually agreed, which is based upon service ratings from passengers as well as the cyclical nature of the cruise line operator. Most staff work 77-hour work weeks for 10 months continuously followed by 2 months of vacation. There are no paid vacations or pensions for service, non-management crew, depending on the level of the position and the type of the contract. Non-service and management crew members get paid vacation, medical, retirement options, and can participate in the company's group insurance plan. The direct salary is low for North American standards, though restaurant staff have considerable earning potential from passenger tips. Crew members do not have any expenses while on board as food and accommodation, medical care, and transportation for most employees, are included. This makes a cruise ship career financially attractive enough to compensate for lack of employment benefits. Nonetheless, Oyogoa states that "Crewing agencies often exploit the desperation of potential employees." Living arrangements vary by cruise line, but mostly by shipboard position. In general two employees share a cabin with a shower, commode and a desk with a television set, while senior officers are assigned single cabins. There is a set of facilities for the crew separate from that of passengers, such as mess rooms and bars, recreation rooms, prayer rooms/mosques, and fitness center, with some larger ships even having a crew deck with a swimming pool and hot tubs. For the largest cruise operators, most "hotel staff" are hired from under-industrialized countries in Asia, Eastern Europe, the Caribbean, and Central America. While several cruise lines are headquartered in the United States, like most international shipping company, ships are registered in countries including the Netherlands, the UK, the Bahamas, and Panama. The International Labour Organization's 2006 Maritime Labour Convention, also known as the "Seafarers' Bill of Rights," provides comprehensive rights and protections for all crewmembers. The ILO sets rigorous standards regarding hours of work and rest, health and safety, and living conditions for crewmembers and requires governments to ensure ships are in compliance. For cruise routes around Hawaii, operators are required to register their ships in the United States and the crew is unionized, so these cruises are typically much more expensive than Caribbean and Mediterranean. Most cruise lines since the 2000s have priced the cruising experience, to some extent, a la carte, as passengers spending aboard generates significantly more than ticket sales. The passenger's ticket includes the stateroom accommodation, room service, unlimited meals in the main dining room (or main restaurant) and buffet, access to shows, and use of pool and gym facilities, while there is a daily gratuity charge to cover housekeeping and waiter service. However, there are extra charges for alcohol and soft drinks, official cruise photos, Internet and wi-fi access, and specialty restaurants; it has been reported that the casino and photos have high profit margins. Cruise lines earn significantly from selling onshore excursions (keeping 50 percent or more of what passengers spend for these tours) offered by local contractors. In addition, cruise ships earn significant commissions for sales from onshore stores that are promoted on board as "preferred" (as much as 40 percent of gross sales). Facilitating this practice are modern cruise terminals with establishments of duty-free shops inside a perimeter accessible only by passengers and not locals. Ports of call have often oriented their own businesses and facilities towards meeting the needs of visiting cruise ships. In one case, Icy Strait Point in Alaska, the entire destination was created explicitly and solely for cruise ship visitors. Travel to and from the port of departure are the passengers' responsibility, although purchasing a transfer pass from the cruise line for the trip between the airport and cruise terminal will guarantee that the ship will not leave until the passenger is aboard. Similarly, if the passenger books a shore excursion with the cruise line and the tour runs late, the ship is obligated to remain until the passenger returns. Luxury cruise lines such as Regent Seven Seas Cruises and Crystal Cruises market their fares as "all-inclusive". For example, base fare on Regent Seven Seas ships includes most alcoholic beverages onboard ship and most shore excursions in ports of call, as well as all gratuities that would normally be paid to hotel staff on the ship. The fare may also include a one-night hotel stay before boarding, and airfare to and from the cruise's origin and destination ports. Older cruise ships have had multiple owners. it is usual for the transfer of ownership to entail a refitting and a name change. Some ships have had a dozen or more identities. Many cruise lines have a common naming scheme they use for their ships. Some lines use their name as a prefix or suffix in the ship name (such as the prefixes of "Carnival", "AIDA", "Disney", or "Norwegian" and the suffix of "Princess"). Other lines use a unique word or phrase (such as the prefix of "Pacific" for P&O Cruises Australia or the suffixes "of the Seas" for Royal Caribbean International or "-dam" for ships of the Holland America Line). The addition of these prefixes and suffixes allows multiple cruise lines to use the same popular ship names while maintaining a unique identifier for each ship. Due to slower speed and reduced seaworthiness, as well as being largely introduced after several major wars, cruise ships have never been used as troop transport vessels. By contrast, ocean liners were often seen as the pride of their country and used to rival liners of other nations, and have been requisitioned during both World Wars and the Falklands War to transport soldiers and serve as hospital ships. Cruise ships and former liners often find employment in applications other than those for which they were built. A shortage of hotel accommodation for the 2004 Summer Olympics led to a plan to moor a number of cruise ships in Athens to provide tourist accommodation. On 1 September 2005, the U.S. Federal Emergency Management Agency (FEMA) contracted three Carnival Cruise Lines vessels (Carnival Fantasy, the former Carnival Holiday, and the Carnival Sensation) to house Hurricane Katrina evacuees. In 2010, in response to the shutdown of UK airspace due to the eruption of Iceland's Eyjafjallajökull volcano, the newly completed Celebrity Eclipse was used to rescue 2000 British tourists stranded in Spain as an act of goodwill by the owners. The ship departed from Southampton for Bilbao on 21 April, and returned on 23 April. In 2017, cruise ships were used to help transport residents off of some Caribbean islands destroyed by Hurricane Irma as well as Puerto Rico residents displaced by Hurricane Maria. Most cruise ships sail the Caribbean or the Mediterranean. Others operate elsewhere in places like Alaska, the South Pacific, the Baltic Sea and New England. A cruise ship that is moving from one of these regions to another will commonly operate a repositioning cruise while doing so. Expedition cruise lines, which usually operate small ships, visit certain more specialized destinations such as the Arctic and Antarctica, or the Galápagos Islands. The number of cruise tourists worldwide in 2005 was estimated at some 14 million. The main region for cruising was North America (70% of cruises), where the Caribbean islands were the most popular destinations. The second most popular region was continental Europe (13%), where the fastest growing segment is cruises in the Baltic Sea. The most visited Baltic ports are Copenhagen, St. Petersburg, Tallinn, Stockholm and Helsinki. The seaport of St. Petersburg, the main Baltic port of call, received 426,500 passengers during the 2009 cruise season. According to 2010 CEMAR statistics the Mediterranean cruise market is going through a fast and fundamental change; Italy has won prime position as a destination for European cruises, and destination for the whole of the Mediterranean basin. The most visited ports in Mediterranean Sea are Barcelona (Spain), Civitavecchia (Italy), Palma (Spain) and Venice (Italy). 2013 saw the entrance of the first Chinese company into the cruise market. China's first luxury cruise ship, Henna, made her maiden voyage from Sanya Phoenix Island International Port in late January. The Caribbean cruising industry is one of the largest in the world, responsible for over $2 billion in direct revenue to the Caribbean islands in 2012. Over 45,000 people from the Caribbean are directly employed in the cruise industry. An estimated 17,457,600 cruise passengers visited the islands in the 2011-2012 cruise year (May 2011 to April 2012.) Cruise lines operating in the Caribbean include Royal Caribbean International, Princess Cruises, Carnival Cruise Line, Celebrity Cruises, Disney Cruise Line, Holland America, P&O, Cunard, Crystal Cruises, Pullmantur Cruises and Norwegian Cruise Line. There are also smaller cruise lines that cater to a more intimate feeling among their guests. The three largest cruise operators are Carnival Corporation, Royal Caribbean International, and Star Cruises/Norwegian Cruise Lines. Many American cruise lines to the Caribbean depart out of the Port of Miami, with "nearly one-third of the cruises sailing out of Miami in recent years". Other cruise ships depart from Port Everglades (in Fort Lauderdale), Port Canaveral (approximately 45 miles (72 km) east of Orlando), New York, Tampa, Galveston, New Orleans, Cape Liberty, Baltimore, Jacksonville, Charleston, Norfolk, Mobile, and San Juan, Puerto Rico. Some UK cruise lines base their ships out of Barbados for the Caribbean season, operating direct charter flights out of the UK. Mitsubishi Heavy Industries of Japan. A large number of cruise ships have been built by other shipyards, but no other individual yard has reached the large numbers of built ships achieved by the four above. As most of the passengers on a cruise are affluent and have considerable ransom potential, not to mention a considerable amount of cash and jewelry on board (casino and shops), there have been several high-profile pirate attacks on cruise ships, such as on the Seabourn Spirit and MSC Melody. As a result, cruise ships have implemented various security measures. While most merchant shipping firms have generally avoided arming crew or security guards for reasons of safety, liability and conformity with the laws of the countries where they dock, cruise ships have small arms (usually semi-automatic pistols) stored in a safe accessible only by the captain who distributes them to authorized personnel such as security or the master-at-arms. The ship's high-pressure fire hoses can be used to keep boarders at bay, and often the vessel itself can be maneuvered to ram pirate craft. A recent technology to deter pirates has been the LRAD or sonic cannon which was used in the successful defense of Seabourn Spirit. A related risk is that of terrorism, the most notable incident being that of the 1985 hijacking of the Achille Lauro, an Italian cruise ship. Passengers entering the cruise ship are screened by metal detectors. Explosive detection machines used include X-ray machines and explosives trace-detection portal machines (a.k.a. "puffer machines"), to prevent weapons, drugs and other contraband on board. Security has been considerably tightened since September 11, 2001, such that these measures are similar to airport security. In addition to security checkpoints, passengers are often given a ship-specific identification card, which must be shown in order to get on or off the ship. This prevents people boarding who are not entitled to do so, and also ensures the ship's crew are aware of who is on the ship. The Cruise Ship ID cards are also used as the passenger's room key. CCTV cameras are mounted frequently throughout the ship. Passengers on cruise vessels have an inadequate appreciation of their potential vulnerability to crime while on ocean voyages, and those who may be victimized lack the information they need to understand their legal rights or to know whom to contact for help in the immediate aftermath of the crime. install acoustic hailing and warning devices capable of working at a distance. flags of ships be disregarded for nations unable to investigate incidents thoroughly and competently. The lobby group International Cruise Victims Association, based in Arizona, pushes for more regulation of the cruise industry, and supports victims of crimes committed on cruise ships. Modern cruise ships are tall but remain stable due to their relatively low center of mass. This is due to large open spaces and the extensive use of aluminium, high-strength steel and other lightweight materials in the upper parts, and the fact that the heaviest components — engines, propellers, fuel tanks and such — are located at the bottom of the hull. Thus, even though modern cruise ships may appear tall, proper weight distribution ensures that they are not top-heavy. Furthermore, large cruise ships tend to be very wide, which considerably increases their initial stability by increasing the metacentric height. Although most passenger ships utilize stabilizers to reduce rolling in heavy weather, they are only used for crew and passenger comfort and do not contribute to the overall intact stability of the vessel. The ships must fulfill all stability requirements even with the stabilizer fins retracted. Norovirus is a virus that commonly causes gastroenteritis in developed countries, and is also a cause of gastroenteritis on cruise ships. It is typically transmitted from person to person. Symptoms usually last between 1 and 3 days and generally resolve without treatment or long term consequences. The incubation period of the virus averages about 24 hours. Norovirus outbreaks are often perceived to be associated with cruise ships. According to the United States CDC, the factors that cause norovirus to be associated with cruise ships include the closer tracking and faster reporting of illnesses on cruise ships compared to those on land; the closer living quarters that increases the amount of interpersonal contact; as well as the turnover of passengers that may bring the viruses onboard. However, the estimated likelihood of contracting gastroenteritis from any cause on an average 7-day cruise is less than 1%. In 2009, during which more than 13 million people took a cruise, there were nine reported norovirus outbreaks on cruise ships. Outbreak investigations by the United States Centers for Disease Control and Prevention (CDC) have shown that transmission among cruise ship passengers is primarily person-to-person; potable water supplies have not been implicated. In a study published in the Journal of the American Medical Association, the CDC reported that, "Perceptions that cruise ships can be luxury breeding grounds for acute gastroenteritis outbreaks don't hold water. A recent CDC report showed that from 2008 to 2014, only 0.18% of more than 73 million cruise passengers and 0.15% of some 28 million crew members reported symptoms of the illness." Ships docked in port undergo surprise health inspections. In 2009, ships that underwent unannounced inspections by the CDC received an average CDC Vessel Sanitation Program score of approximately 97 out of a total possible 100 points. The minimum passing inspection score is 85. Collaboration with the CDC's Vessel Sanitation Program and the development of Outbreak Prevention and Response Plans has been credited in decreasing the incidence of norovirus outbreaks on ships. Other pathogens which can colonise pools and spas including those on cruise ships include Legionella, the bacterium which causes Legionnaires' disease. Legionella, and in particular the most virulent strain, Legionella pneumophila serogroup 1, can cause infections when inhaled as an aerosol or aspirated. Individuals who are immunocompromised and those with pre-existing chronic respiratory and cardiac disease are more susceptible. Legionnaires' has been infrequently associated with cruise ships. The Cruise industry Vessel Sanitation Program has specific public health requirements to control and prevent Legionella. Enterotoxigenic Escherichia coli is a form of E. coli and the leading bacterial cause of diarrhea in the developing world, as well as the most common cause of diarrhea for travelers to those areas. Since 2008 there has been at least one reported incident each year of E. coli on international cruise ships reported to the Vessel Sanitation Program of the Centers for Disease Control, though there were none in 2015. Causes of E. coli infection include the consumption of contaminated food and the ingestion of water in swimming pools contaminated by human waste. "Cruise ships generate a number of waste streams that can result in discharges to the marine environment, including sewage, graywater, hazardous wastes, oily bilge water, ballast water, and solid waste. They also emit air pollutants to the air and water. These wastes, if not properly treated and disposed of, can be a significant source of pathogens, nutrients, and toxic substances with the potential to threaten human health and damage aquatic life. Cruise ships represent a small — although highly visible — portion of the entire international shipping industry, and the waste streams described here are not unique to cruise ships. Particular types of wastes, such as sewage, graywater, and solid waste, may be of greater concern for cruise ships relative to other seagoing vessels, because of the large numbers of passengers and crew that cruise ships carry and the large volumes of wastes that they produce. Because cruise ships tend to concentrate their activities in specific coastal areas and visit the same ports repeatedly (especially Florida, California, New York, Galveston, Seattle, and the waters of Alaska), their cumulative impact on a local scale could be significant, as can impacts of individual large-volume releases (either accidental or intentional)." Most cruise ships run (primarily) on heavy fuel oil (HFO)/ bunker fuel, which, because of its high sulphur content, results in sulphur dioxide emissions worse than those of equivalent road traffic. The international MARPOL IV-14 agreement for Sulphur Emission Control Areas requires less than 0.10% sulphur in the fuel, contrasting with Heavy Fuel Oil. Cruise ships may use 60 percent of the fuel energy for propulsion, and 40 percent for hotel functions, but loads and distribution depend highly on conditions. Some cruise lines, such as Cunard, are taking steps to reduce environmental impact by refraining from discharges (RMS Queen Mary 2 has a zero-discharge policy) and reducing their CO2 output every year. ^ Compare: Mayntz, Melissa. "Cruise to Nowhere". Cruises.lovetoknow.com. Retrieved 2018-11-02. A two-night, three-day cruise to nowhere can offer a quick vacation for a very reasonable price. Ships depart from their home port and sail in a loop to and from the same port, without any other stops. ^ a b Roughan, John (16 February 2007). "The ocean-going stretch limo". The New Zealand Herald. Retrieved 26 September 2011. 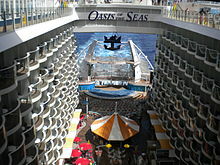 ^ "Cruise Market Watch Announces 2011 Cruise Line Market Share and Revenue Projections". Cruise Market Watch. 2010-12-11. ^ Leasca, Stacey (23 March 2018). "Royal Caribbean Just Beat Its Own Record For World's Largest Cruise Ship". Travel + Leisure. ^ LeRosasca, Miquel (4 December 2018). "15 biggest cruise ships in the world". CNN. ^ "CRUISE NEWS JUNE 2012". Retrieved 2014-01-09. ^ [dead link]For example, by Kludas and Bischoff; Gerhardt p. 36 (pdf p. 38); Haller, giving 174 as the number of passengers. ^ Peter Quartermaine (2006). "History and Culture". Cruise: Identity, Design and Culture. Laurence King Publishing. ^ "The history of cruises". Hamburg Cruise Days. ^ Kludas, Arnold (1999). Record breakers of the North Atlantic, Blue Riband Liners 1838-1953. London: Chatham. ^ Warren, Mark (1993). The Cunard Royal Mail Steamers Campania and Lucania. Patrick Stephens Limited. ISBN 978-1-85260-148-5. ^ "RMS Majestic (I) - The White Star Line History Website". Whitestarhistory.com. Retrieved 2014-01-13. ^ "TGOL - Teutonic". Thegreatoceanliners.com. Retrieved 2014-01-13. ^ "Ships of Compagnie Générale Transatlantique". Frenchlines.com. Retrieved 2014-01-13. ^ "Cruise Industry Trends From the 70s to 90s". ^ Best, Keilani (17 March 2010). "Cruise group celebrates growth of 'floating cities'". Melbourne, Florida: Florida Today. pp. 6C. ^ Travel Mole, Work starts on world's largest cruise ship, 2007-12-12. ^ Saunders, Aaron (December 19, 2013). Giants of the Sea: The Ships that Transformed Modern Cruising. Seaforth Publishing. ISBN 978-1848321724. ^ "What cruise lines don't want you to know". CNN.com. Retrieved 2014-01-13. ^ Remarks of ship's captain, Baltimore Harbor, October 5, 2013. ^ Matousek, Mark (25 February 2019). "The CEO of Carnival reveals the cruise industry's biggest challenge right now". Business Insider. Retrieved 25 February 2019. ^ Lallani, Shayan S. (October 2017). "Mediating Cultural Encounters at Sea: Dining in the Modern Cruise Industry". Journal of Tourism History. 9 (2–3): 160–177. doi:10.1080/1755182X.2017.1386725. ^ Lizzie Porter (10 March 2016). "How cruise lines mop up after 3,500 passengers - and brace themselves for thousands more". Daily Telegraph. Retrieved 9 August 2016. ^ Anish (9 October 2017). "How is Power Generated and Supplied on a Ship?". Marine Insight. Retrieved 26 September 2018. ^ Matthew Taylor (26 September 2018). "Air pollution fears fuel fight against new London cruise ship terminal". The Guardian. Retrieved 26 September 2018. ^ Caracciolo, Frankie (16 May 2018). "What Happens When Someone Dies During a Cruise". Thrillist. Retrieved 17 May 2018. ^ "High Seas, Low Pay; Working on Cruise Ships". Cruisejunkie.com. Retrieved 2013-02-06. ^ a b Ross A. Klein (2010-04-13). "The cost of cruising | The Vancouver Observer - Page 1". The Vancouver Observer. Retrieved 2013-02-06. ^ "Cruise Ship Jobs - Frequently Asked Questions". Cruiseshipjob.com. Retrieved 2013-02-06. ^ "Maritime Labour Convention, 2006". www.ilo.org. Retrieved 2016-04-22. ^ "ILO Maritime Labour Convention". International Transport Workers Federation. 2013-08-20. Retrieved 2016-04-22. ^ a b c Ross A. Klein (2010-04-13). "The cost of cruising". The Vancouver Observer. Retrieved 2013-02-06. ^ Hannafin, Matt; Sarna, Heidi (2010). Frommer's Cruises and Ports of Call. John Wiley & Sons. p. 595. ^ Mullally, Linda (2010-11-21). "In search of bargains at sea: Deciphering the deals from cruise lines". Monterey Herald. Retrieved 2010-12-09. ^ Faust, Chris Gray (2015-10-28). "Top 5 Luxury All-Inclusive Cruises". Cruise Critic. Retrieved 2016-10-31. ^ a b "The Regent Experience". Regent Seven Seas Cruises. Retrieved 2016-10-31. ^ "Cruise Baltic Status Report" (PDF). 2007. p. 11. ^ "Helsinki port guide". 2008. ^ "St. Petersburg Times". 2009. ^ "Cemar 2010 report" (PDF). 2010. p. 1. ^ "Henna charts new course for China's cruise tourism". TTGmice. Retrieved 14 February 2013. ^ Pattullo, Polly (1996-01-01). Last Resorts: The Cost of Tourism in the Caribbean. Monthly Review Press. pp. 156–158. ISBN 978-0-85345-977-4. ^ a b "Latest Statistics 2013" (PDF). onecaribbean.org. Caribbean Tourism Organization. 26 June 2014. p. 6. Retrieved 1 October 2014. ^ a b Hooper, John (2009-04-26). "Italian cruise ship fends off pirates with gunfire". London: The Guardian. Retrieved 2009-04-26. ^ BBC News: "I beat pirates with a hose and sonic cannon"
^ "Drugs". Cruise Law News. ^ "Cruise Vessel Security and Safety Act of 2010" (PDF). Congress.gov. United States Congress. 27 July 2010. Retrieved 16 March 2019. ^ "H.R. 3360 (111th): Cruise Vessel Security and Safety Act of 2010". www.GovTrack.us. Civic Impluse, LLC. 15 March 2019. Retrieved 16 March 2019. ^ Milledge, Magistrate Jacqueline M. (3 December 2010). "THE "BRIMBLE" RECOMMENDATIONS" (PDF). Coroners Court of New South Wales. Retrieved 16 March 2019. ^ "Victims Helping Victims: Together We Are Making A Difference". International Cruise Victims. Retrieved 16 March 2019. ^ "Why aren't cruise ships top heavy?". Beyond Ships. Retrieved 7 June 2012. ^ "How stable are cruise ships like the Costa Concordia?". New Scientist. 16 January 2012. Retrieved 14 November 2012. ^ Of Stabilizers, Stability and Lawyers. Rick Spilman. Retrieved 2012-11-14. ^ Ahmed SM, Hall AJ, Robinson AE, et al. (August 2014). "Global prevalence of norovirus in cases of gastroenteritis: a systematic review and meta-analysis". Lancet Infect Dis. 14 (8): 725–30. doi:10.1016/S1473-3099(14)70767-4. PMID 24981041. ^ CDC VSP. "Vessel Sanitation Program - Outbreak Updates for International Cruise Ships". Centers for Disease Control and Prevention. Retrieved 9 May 2016. ^ Moore MD, Goulter RM, Jaykus L (April 2015). "Human Norovirus as a Foodborne Pathogen: Challenges and Developments". Annual Review of Food Science and Technology. 6 (1): 411–33. doi:10.1146/annurev-food-022814-015643. PMID 25884284. ^ "Cruise Ship Illness Declines". JAMA. 315 (8): 743. 2016-02-23. doi:10.1001/jama.2016.0733. ISSN 0098-7484. ^ "Legionnaires' fear on cruise ship". BBC News. 2007-07-30. Retrieved 2010-04-30. ^ World Health Organization. Enterotoxigenic Escherichia coli (ETEC). ^ Copeland, Claudia. "Cruise Ship Pollution: Background, Laws and Regulations, and Key Issues" Archived 17 December 2008 at the Wayback Machine (Order Code RL32450). Congressional Research Service (Updated 6 February 2008). This article incorporates text from this source, which is in the public domain. ^ Vidal, John (2016-05-21). "The world's largest cruise ship and its supersized pollution problem". the Guardian. Retrieved 2018-08-21. Cruise companies create a picture of being a bright, clean and environmentally friendly tourism sector. But the opposite is true. One cruise ship emits as many air pollutants as five million cars going the same distance because these ships use heavy fuel that on land would have to be disposed of as hazardous waste."... "Heavy fuel oil can contain 3,500 times more sulphur than diesel that is used for land traffic vehicles. Ships do not have exhaust abatement technologies like particulate filters that are standard on passenger cars and lorries. ^ "bunker fuel". Cruise Law News. 2017-03-31. Retrieved 2018-08-21. ^ "Clean up the Shipping Industry". Stand.earth. 2016-12-14. Retrieved 2018-08-21. ^ Neslen, Arthur (2017-07-11). "Shipping companies urged to stop using dirty fuels in the Arctic". the Guardian. Retrieved 2018-08-21. ^ "Mandatory Fuel Oil Change Over Procedures as from 1 July 2010 | Marpol, Statutory | ANCO Maritime Activities Ltd". ANCO. 22 May 2010. Retrieved 30 March 2019. ^ Stensvold, Tore (29 March 2019). "Eksperter tviler på at lavt smøreoljenivå er hele forklaringen". Tu.no (in Norwegian). Teknisk Ukeblad. Retrieved 30 March 2019. Berger, Arthur Asa (2004). Ocean Travel and Cruising: A Cultural Analysis. New York: Haworth Hospitality Press. ISBN 978-0789021984. Butler, Manuel (2010). Cruise Tourism: Current Situation and Trends. Madrid: World Tourism Organization. ISBN 9789284413645. Cartwright, Roger; Baird, Carolyn (1999). The Development and Growth of the Cruise Industry. Oxford: Butterworth-Heinemann. ISBN 978-0750643849. Cudahy, Brian J. (2001). The Cruise Ship Phenomenon in North America. Centreville, MD, USA: Cornell Maritime Press. ISBN 978-0870335297. Dawson, Philip (2000). Cruise Ships: An Evolution in Design. London: Conway Maritime Press. ISBN 9780851776606. Dickinson, Robert H.; Vladimir, Andrew N. (2008). Selling the Sea: An Inside Look at the Cruise Industry (2nd ed.). Hoboken, NJ, USA: John Wiley & Sons. ISBN 9780471749189. Douglas, Norman; Douglas, Ngaire (2004). The Cruise Experience: Global and Regional Issues in Cruising. Frenchs Forest, NSW, Australia: Pearson Hospitality Press. ISBN 978-1862505124. Dowling, Ross K., ed. (2006). Cruise Ship Tourism. Wallingford: CAB International. ISBN 978-1845930486. Klein, Ross A. (2002). Cruise Ship Blues: The Underside of the Cruise industry. Gabriola Island, BC, Canada: New Society Publishers. ISBN 978-0865714625. Garin, Kristoffer A. (2005). Devils on the Deep Blue Sea: the dreams, schemes, and showdowns that built America's cruise-ship empires. New York: Viking. ISBN 978-0670034185. Middlemiss, Norman L. (1997). World Cruise Ships: The History and Development of Cruising. Newcastle-upon-Tyne, UK: Shield Publications. ISBN 978-1871128154. Munsart, Craig (2015). A Cruise Ship Primer: History & Operations. Atglen, PA, USA: Schiffer Publishing. ISBN 9780870336386. Peter, Bruce (2017). Cruise Ships: A Design Voyage. Ramsey, Isle of Man: Ferry Publications. ISBN 9781911268086. Quartermaine, Peter; Peter, Bruce (2006). Cruise: Identity, Design and Culture. London: Laurance King Publishing. ISBN 9781856694469. Saunders, Aaron (December 19, 2013). Giants of the Sea: The Ships that Transformed Modern Cruising. Seaforth Publishing. ISBN 978-1848321724. Ulrich, Kurt (1998). Monarchs of the Sea: The Great Ocean Liners. London: Tauris Parke. ISBN 978-1860643736. 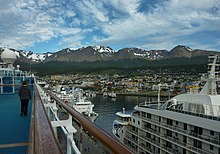 Wikivoyage has a travel guide for Cruise ships.